PHOTOS - OPENING RECEPTION AT BOX32 !!! Thanks to all of you out there for making the opening reception to such a great success. In case you missed the exhibition the amazing art will be hanging till September 23rd. Have fun looking at the pictures. Stay tuned and create SIXMOREVODKA. 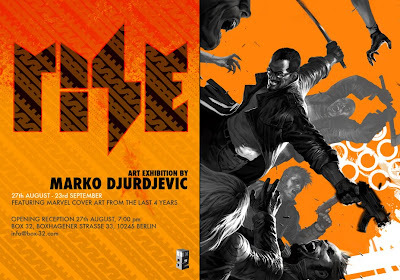 Marko Djurdjevic, berlin based cover artist for MARVEL COMICS, celebrates what's been 4 years in the making. Plenty of his cover artwork will be exhibited for the first time on large scale at gallery BOX 32 in Berlin. Join us for this one time event in cooperation with SIXMOREVODKA on August 27th, at 7:00 pm! Over the past 4 years, Marko Djurdjevic has become one of the major powerhouses of cover creation on the American Comic Market. Within a short period of time, Marko painted over 250 covers for every major series of MARVEL COMICS, introducing his unique design sensibilities and his modern storytelling skills to a medium of tradition. The RISE exhibition will feature a Best of, showcasing the most successful pieces as oversized prints for the first time in public. Hailing from a background in Conceptart and classical Illustration, now merging his pencil techniques with digital painting, Marko Djurdjevic is one of the driving creative forces in the field of comic and entertainment design today. After spending a good chunk of his career in San Francisco, working at the esteemed Conceptart outsourcing studio Massive Black, he's now back in Berlin, from where he's juggling his operations across the globe. Meet Marko Djurdjevic on the night of the opening reception at BOX 32, on August 27th, at 7:00 pm, for talks, drinks and DJ Delphonic joining us for music. We're excited to make this happen!